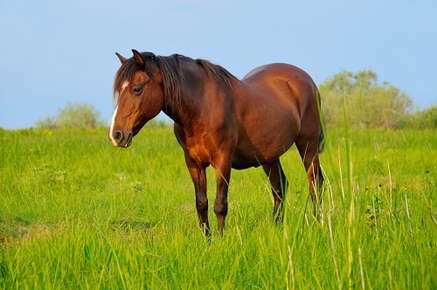 Horse lameness is a condition that occurs when a horse is unable to move normally. While the majority of horse lameness is related to the foot, this condition may be caused by problems in a horse’s bones, muscles, nerves, tendons or ligaments. Repetitive injuries, infection, poor nutrition, tooth problems, and founder (also known as laminitis) are the primary causes for horse lameness. It may occur gradually over time or suddenly with little warning. In some cases, lameness may resolve itself; however, veterinary intervention is often required to proactively treat this condition and prevent additional health problems. Lameness is the most common cause of poor performance in sport horses. Diseases or injuries to the musculoskeletal system are a major cause for poor athletic performance. The age, breed and gender of a horse are also important. Certain causes for lameness are more likely to affect certain breeds and ages of horses. Past medical history is also important in a lameness evaluation. An equine veterinarian is trained to diagnose and evaluate lameness in a horse. The more severely lame a horse is, the more noticeable this lameness will be in the horse’s walk. A horse will be evaluated at a trot (jog), which is the optimal gait for detecting lameness. A horse will be observed from both the front and the back while the horse is moving to detect lameness. • 3: Consistently observable at a trot under all circumstances. Once a horse is diagnosed with lameness, the most effective treatment options are those that directly target the underlying cause for lameness. In general, this means reducing exercise and the weight of the horse. Medications for horse lameness are non-steroidal anti-inflammatory medications that fight pain and improve joint mobility. Some injectable medications are also available to protect joint cartilage and support normal joint fluid. Hoof supplements that contain biotin, zinc, copper, complete proteins, and Omega 3 fatty acids may also be beneficial, depending on the cause for lameness. Moore, Rustin M. DVM, PhD, DACVS; Burba, Daniel J., DVM, DACVS. “Musculoskeletal Causes of Lameness and Poor Performance in Horses.” Louisiana State University, School of Veterinary Medicine.